Dementia is the “chronic condition of the 21st Century” and post-diagnosis support is crucial for people living with dementia and their families, the Royal Commission has heard today. Dementia Australia CEO Maree McCabe addresses the Royal Commission in Adelaide. 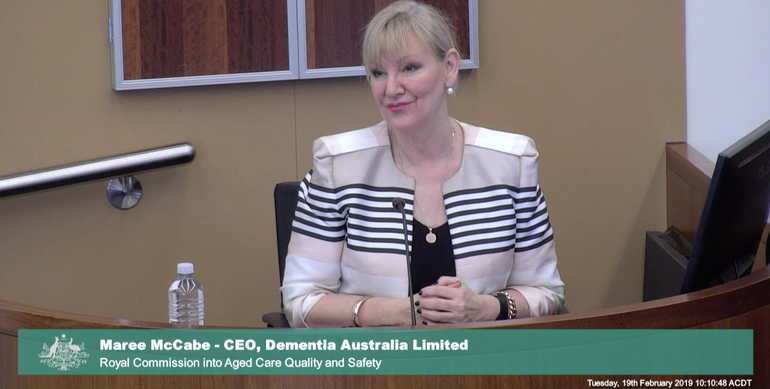 Chief Executive Officer (CEO) of Dementia Australia, Maree McCabe gave evidence in Adelaide this morning, calling for mandatory dementia education for aged care workers. “With more than 50 percent of people in residential aged care living with a diagnosis of dementia, it is essential that a minimum level of dementia specific training becomes a national prerequisite to work in aged care across all parts of the system,” Ms McCabe says. Ms McCabe says empathy is a key element of dementia training. She says Dementia Australia’s immersive, educational experience can simulate the experience of living with dementia, which Ms McCabe says can help change people’s behaviour and attitude towards people living with the disease. “I think it’s really important that we look at this as a cultural element to the change that’s required around mandatory training,” she says. Ms McCabe also highlights a need for more dementia training for GPs, saying there can be a reluctance to diagnose dementia due to the lack of treatments available. “They may only see a couple of people a month with dementia, so it’s not front of mind,” she says. Ms McCabe says GPs can “normalise” dementia because there’s no current cure. Referring to a report by Dementia Australia, Ms McCabe says 60 percent of people surveyed didn’t know how to talk to people with dementia. She says negative stigma plays a huge part in this statistic. She says dementia can be “the most profound isolating diagnosis”, adding that family and friends can be “confronted” with the diagnosis. “Family and friends fall away and (the person with dementia) is not included in social functions anymore. People often relate to people living with dementia like they have lost all capacity, which is not the case. Ms McCabe says the Royal Commission is a “once in a generation opportunity” to transform the industry. CEO of Aged and Community Services Australia (ACSA) Pat Sparrow also gave evidence this morning and says improving staff-to-resident ratios won’t go far enough to improve quality of care. Senior Counsel Assisting Dr Timothy McEvoy asked Ms Sparrow why ACSA doesn’t support minimum staffing ratios and how providers are to access the appropriate number of staff to meet requirements. Ms Sparrow says ACSA calls for information about staffing models within a residential aged care facility that will inform people about the type of care they can expect. “It’s very much based on the profile of residents they have and the needs residents have at any point. Different models of care require different forms of staffing,” Ms Sparrow says. She says consumers need to understand more than just the “flat number” of staff on at any one time, adding that ratios are a “blunt instrument” which don’t tell the whole story about the level of care that’s going to be provided. Ms Sparrow says ACSA supports the new aged care quality standards which are to come into effect on 1 July this year, saying they “focus much more on the individual”. “We regard (the new standards) as broad statements that are focused on what individual residents need and want and we think that’s an important shift,” she says. Dr McEvoy also questioned Ms Sparrow about the use of CCTV cameras in residential care. Ms Sparrow says it’s an issue of consent. “The key thing for me...is that it is actually about consent and we know there are CCTV cameras in many of the public areas already,” she says. “I think that it’s an important principle that the individual in that room and their family….is supported to make that decision. Ms Sparrow says ACSA is looking forward to seeing the outcomes of the Royal Commission.